BALL’s Flat & Curved Glass Power Windows (6V/12V) features floating channels w/ Z support for Hot Rods & Muscle Cars. Made in USA w/ Lifetime Warranty. First used in Mack Trucks on OE basis & also for lifting heavy bullet proof glass - bench tested for over 100,000 cycles !!! Our competitors use plastic contact points that break - No Plastic here !!! AMERICAN Tough :-) Best HD power windows for Bulletproof bullet resistant glass. BALL's is the Manufacturer !!! Pictures of install process for BALL's Power Windows & Trunk Lifts. Our motor wire plug (1985 to Present). Helpful brackets for Power Window & Trunk kits. One Touch ( Express ) Module up & down. 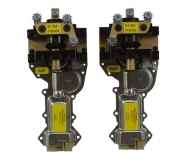 For any Power Window or Power Trunk or Linear Actuator. See more info! Driver's side replacement. Left side. UPS Only. Passenger side replacement. Right side. UPS Only. Power windows kit ideal for both Flat Glass Rear Quarters and/or ALL Curved Glass applications. Fits ALL Years. See more info. Basic Power Window kit for Flat Glass. Basic Switches. Power Vent Motors sold in pairs. See more info.